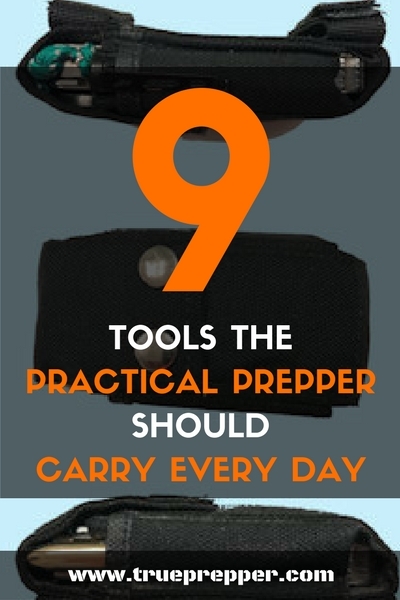 Practical prepping is not just getting ready for the upcoming disaster. It is about being ready to access and effectively use a functional tool when you need it. The best way to have the tool you always need is to have it literally on you when you need it. Basically, you have a toolkit strapped to you. You may have heard this called the “Every Day Carry (EDC) loadout”. It consists of tools small enough to easily carry, but big enough to get the job done. You can dig around the web searching for “EDC” and find a million opinions on what gear to carry, but I already did that and then real-world tested all my gear for over a year. Fisher Space Pen ($16.50) This is the most useful item I carry. It is designed to write at all angles and in all conditions and has never let me down. I use it all the time! The Spirit X is arguable the best multitool you can get for the size and weight. Swiss quality and tools on the outside that lock open make this a winner. It comes with a heavy leather pouch which weighs as much as my whole EDC. Stash it and use the Skinth holder instead. A tiny flashlight with a bright LED bulb! Uses a single AAA battery and has a reversible clip so it will clip on the front of a ball cap. I added a small paracord lanyard to make it easy to pull out. It twists to turn it on and off. Combined pry bar and adjustable wrench that really works. Amazon shows a knock-off that is not as good. The only source I know of is Lee Valley (which the link points to). You could substitute this with another tool like the Leatherman Bruiser, but the Pocketwrench fits in there just right. This amazingly light and sturdy case holds all the items above securely. I asked them for horizontal carry straps and that prevent the kit from hanging down. Their website shows pretty much the same tools I have in the case. The Skinth Holster with my EDC loadout. 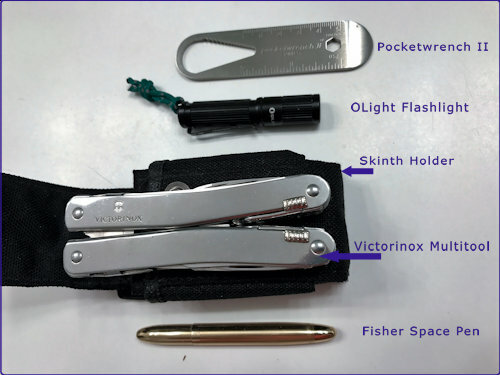 All EDC items held within holster. This is not just any pocket knife, but an assisted opening knife. Only get it if it is legal in your state. This is strong, light, slim, sharp, and can be opened AND closed (with practice) with one hand. My picture shows a Buck 290 because I misplaced my venerable SOG. The Buck is also assisted open but harder to close. Ronson Jetlite Lighter ($7) Cheaper locally but hard to find. The only inexpensive, reliable butane torch lighter I know of. I’m not a smoker and I still find many uses for it. That’s why I carry it always. You can also modify it to make it work better if you are comfortable doing it. Here is a video how. No more fishing around in your pocket when you need your phone. I use a brand called “Platinum” for my iPhone and found it at at Best Buy. I can quickly and easily pull out my phone and replace it with just one hand. 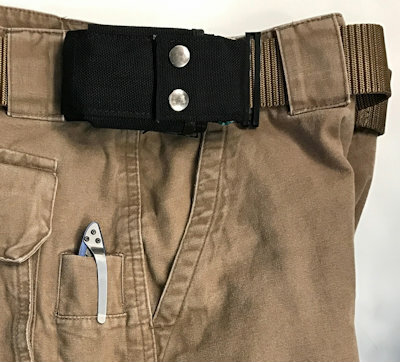 How do you keep a phone clip and a Skinth from sliding around on your belt? I tried Alice clips and they are too loose. The surprising discover: Hair barrettes! They compress perfectly and hold the gear in place. I found them at CVS for $5 for 6 of them. With short hair, I handled the funny looks from the cashier just fine. 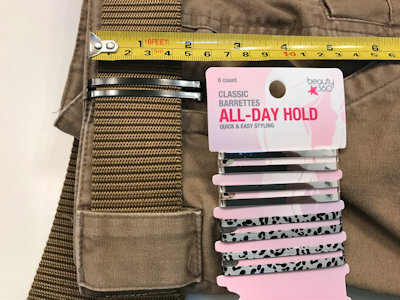 Useful for more than holding hair! 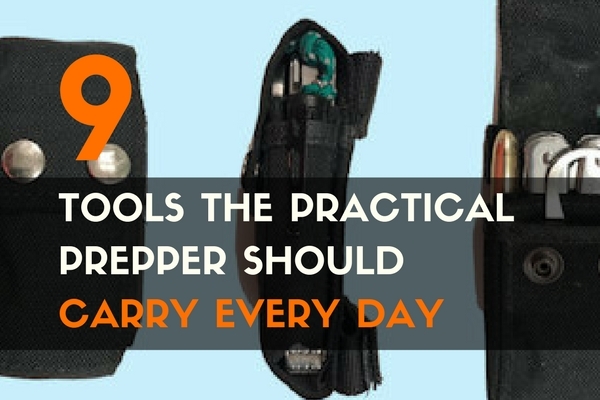 ← Ask a Prepper Series: What is Your Bug Out Shoe of Choice?